As the English Football Association dithers and bleats its way down a Kafka-esque blind alley over its youth development policy, the outlook for the national team has rarely seemed so bleak. Chairman Gregg Dyke’s recent speech to outline the organisation’s ten-year plan inspired little more confidence than the fare Roy Hodgson’s team are serving up on the pitch, and fans and commentators have been left unclear about how arbitrary-sounding targets are to be pursued. What seems clear to everyone concerned with the set-up of the English game however is that home-grown players are entering the formative years of their professional careers ill-equipped in their technical and tactical arsenals to compete with the world’s best talent, both in league football and internationally. Domestic youth policy is crying out for fresh perspectives, but not far from Wembley Stadium there is an organisation forming part of a dynamic new partnership to spearhead the growth of one of Europe’s minnow nations. Cypriot football flashed into the mainstream consciousness in 2012 when domestic champions APOEL Nicosia fought their way to the Champions League quarter-finals, but the national team, traditionally flitting between the continent’s whipping boys and also-rans, have struggled to replicate the impact of the country’s most successful club. The APOEL side eliminated by Real Madrid two years ago owed much of their flair and organisation to a backbone of South American imports and the Mediterranean islanders are yet to produce a crop of players to seriously make an impact in the qualifying process for a major tournament. Now the Cypriot Football Association (CFA) are looking to expat communities abroad to bolster a limited selection pool and ensure no available talent slips through the net. The Cypriot Football League (KOPA) has played a cohesive role in the life of London’s Cypriot community for the better part of a generation, but recently efforts have been made on both sides to harvest the potential of the league to impact on the national game. Last season the league governing body in London sent representative teams at Under-16 and Under-18 level to Cyprus to compete against the islanders’ domestic and national sides in a move part funded by the CFA and the first time that Cypriot football has given official backing to the expat game abroad. Results were mixed for the tourists. 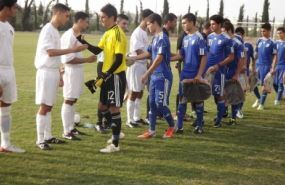 The Under-16s went down to a credible 2-1 defeat against their Cypriot counterparts at youth international level before KOPA league champions New Salamis were thumped 4-0 by the Under-18 national team, but the tour represented the first step on a long road towards renewing Cypriot football from the grassroots upwards and structures are being put in place that could carry the CFA into the next bracket of European football as points of contact between young, eligible players and the national team’s representatives expand. The plan later down that road is for the senior side to take advantage of talent that is unearthed and developed off the back of these transnational meetings and the signs so far are promising with a number of youth players being invited to train with developmental sides at age-group level. The same benefits are being reaped on the other side of the continent with three players earning contracts at English Football League clubs after impressing for KOPA-registered clubs. Jamie Alexandrou already has a league debut for Torquay under his belt, and with Andreas Komodikis and Aris Savva signed to QPR, officials are hopeful that the project will begin to bear tangible results sooner rather than later. For some connected with Cypriot football those results can’t come soon enough. The senior side are coming to the end of disastrous 2014 World Cup qualifying campaign that recently saw coach Nikos Nioplias depart, but it is events elsewhere in Europe that have thrown the team’s performances into stark relief and brought the axe down on the country. The team have picked up just four points in a group that has seen similarly under-resourced nations Iceland and Albania come within spitting distance of qualification, and even in the long narrative of underachievement more was expected of Nioplias’s team in a relatively soft group. The success of Apollon in the women’s Champions League with a nucleus of home-grown players has added weight to the notion that the CFA could be getting more out of its slender resources on the world stage. A rare sense of promise hangs in the atmosphere around Cypriot football as a result of the KOPA partnership, as evidenced by the willingness of state television to fork out for the rights to broadcast the KOPA tour, and the new links with the game in England have got fans believing the CFA are serious about a strategy to become more competitive on the international stage. With firm backing in place from the governing body downwards, through the fans and media partners, everything looks in place for Cyprus to begin clawing their way into the upwardly-mobile pack.